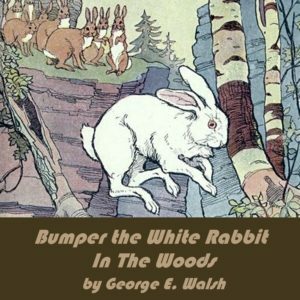 Bumper the White Rabbit in the Woods is the sequel to Bumper the White Rabbit, also available as an audiobook. For those of you who have listened to Bumper the White Rabbit, you’ll know that Bumper is a young white rabbit who lived in the city but escaped from a pen where a nice little red-headed girl had put him. After avoiding some dreadful animals, Bumper has ended up in the woods where he is mistaken for the promised king because he is white and has pink eyes. Bumper quickly realizes that he does not have forest smarts and sets about to learn all he can about the woods hoping to fit in with the rest of the forest rabbits. He quickly finds out that the forest is not what he expected.